Fast forward a decade to my graduate studies in biomechanics and movement science. It turns out this stuff is my jam! As a matter of fact, the human musculoskeletal system is nothing more than an intricate network of levers (bones), with muscles acting on them to produce movement. 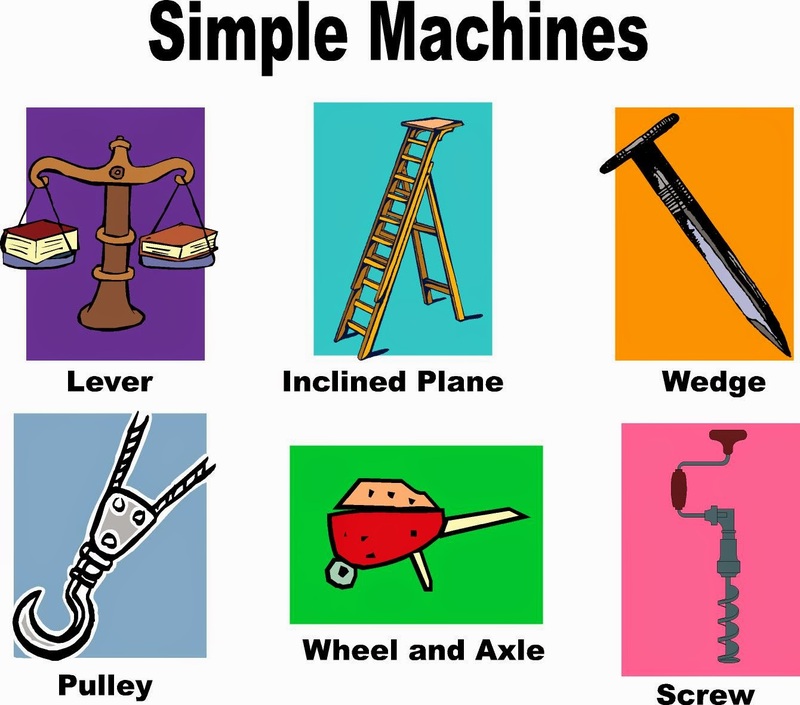 As such, this system can be analyzed in light of simple machine principles like leverage, or mechanical advantage, and the primary topic of this post: moment arms. The upshot? Direct and purposeful applications to resistance training, of course! What the heck is a moment arm, and why should I care about it? The perpendicular distance between the line of action of a force (F) and the axis, or fulcrum, about which the force rotates the lever (r). Jeez, that looks and sounds awfully complicated, doesn’t it? The good news is that when a force pulls straight down towards the ground like gravity does when we lift free weights, the moment arm is always just parallel to the ground. When Kate's arms are down at her sides (left), the moment arm is nearly zero. 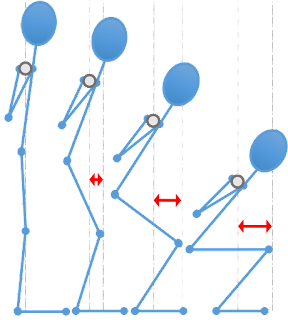 As she begins to lift the weights (middle), the moment arm increases, reaching its maximum length when her arms are parallel to the floor (right). In a lateral raise, the moment arm is longest -- and the exercise hardest -- when the arms are parallel to the floor. So what if the length of the moment arm changes throughout the movement? Great question! 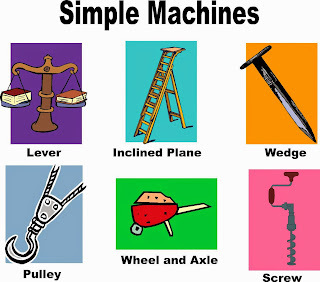 Torque (or turning force) is a product of the amount of weight being lifted and the length of the moment arm. Therefore, the longer the moment arm, the more torque the load exerts on the joint, and, consequently, the heavier the weight feels. That explains why the top of the lateral raise is the hardest, folks! As we discussed above, moment arms are everywhere, including our bodies. In fact, the bones and joints of our body are really just a series of levers and fulcrums, respectively, upon which our muscles act. Hopefully, then, it's clear that knowing a little something-something about moment arms radically enhances our training experience. Explain “sticking points” (the point in the range of motion of an exercise that’s the hardest). Determine and adjust the relative contributions of muscle groups in an exercise. Manipulate mechanical advantage to extend and intensify sets. Increase the difficulty of an exercise without going up in weight. Let's illustrate each of these points with some examples, shall we? 1. Why is the bottom of the squat the hardest? The position at which the moment arm is longest is often referred to as the sticking point. 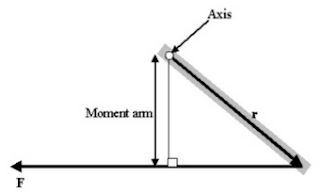 In the case of the squat, the moment arm (red), is the horizontal distance between the fulcrum (the knee) and the vertical line of action of the weight of the bar. The longer the moment arm, the more muscular torque required from the quads to overcome the load. At parallel we see that the moment arm reaches its maximum length. Many lifters experience a sticking point here through which they’re unable to stand the weight up. To avoid the sticking point, some lifters opt to perform half- or even quarter-squats. This cheat strategy enables them to use heavier weight but prevents them from reaping the benefits of full range of motion strengthening. As a squatter returns to standing from the hole (the bottom position), the length of the moment arm decreases, and progressively less torque is required. It's for this reason that accommodating resistance in the form of bands or chains is often used. As the moment arm decreases, the tension in the bands increases, or additional chain links get picked up off the floor, thereby evening out the torque requirement throughout the movement. 2. Why do I feel a squat more in my quads and a deadlift more in my hamstrings and glutes? 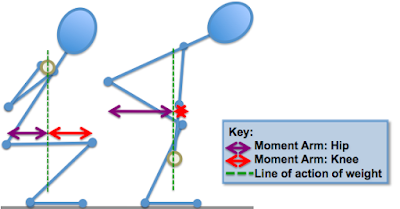 In the squat (left), the moment arm of the knee extensors (red) is the horizontal distance from the knee joint to the vertical line of action of the weight of the bar (dashed green). Because this distance is longer than the moment arm of the hip extensors (purple), the squat taxes the knee extensors (quads) more heavily than the hip extensors (hamstrings and glutes). Conversely, in the deadlift (right), the moment arm of the hip is huge, and the moment arm of the knee is practically nonexistent. The lengths of the moment arms of the knees and hips help determine the relative contribution of the quads compared to the hamstrings and glutes. With all this said, subtle tweaks in the performance of both the squat and the deadlift can alter the moment arms and shift the focus from one joint more to the other. On the other hand, a more upright torso and greater degree of knee bend in the deadlift turns it into a slightly more knee-dominant movement. We can use these facts to our advantage to work towards our strengths. However, if we exaggerate the positional changes too much, we can end up in compromised positions -- squatting our deadlifts and performing "squat-mornings" instead of squats. 3. How can I incorporate moment arm concepts into drop sets? Drop sets are an intensity technique that bodybuilders use to extend sets past conventional failure. They’re typically performed by going to failure on a given exercise, quickly decreasing the amount of weight slightly, going to failure again, and repeating this process as tolerated. For instance, if I have access to a set of pre-loaded barbells, I can do a set of curls to failure, quickly drop down 10 pounds, do another set to failure, and so on, until I’m curling the puniest bar in the gym and everyone is wondering why I’m so embarrassingly weak. With mechanical advantage drop sets, instead of gradually decreasing the load, we manipulate our leverage. That is, as we tire, we shorten the moment arm of the load in order to put ourselves at an ever-increasing mechanical advantage (i.e. make the exercise easier). Take a plank, for example. We can begin with a very challenging “Lalanne plank,” transition to a regular plank, and finish in a modified plank (knees on the ground or arms elevated on a bench). 4. How does the moment arm play into progressive overload? Progressive overload isn't limited to lifting heavier weights or doing more reps. It turns out there are countless other ways to progress besides increasing reps and weight. One of the simplest, and often overlooked, methods of progressive overload is using the same weight and just lengthening the moment arm. Take bodyweight back extensions, for example. We might start off by crossing our arms in front of our chest for 3 sets of 8-12 reps. Once we're consistently hitting 3 sets of 12 reps, we can start back at sets of 8 reps with arms in the "prisoner position" (hands behind the head). For the final bodyweight progression, we can hold our arms overhead in a 'Y'. 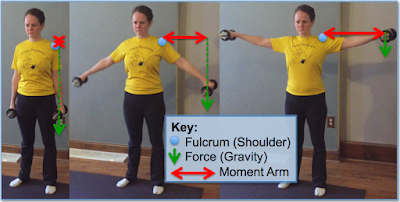 As we move our arms up, we distribute the load further from the fulcrum (our hips), thereby lengthening the moment arm and increasing the difficulty of the exercise. Voilà! Knowledge of moment arms can be used to make an exercise like back extensions harder without adding more weight. 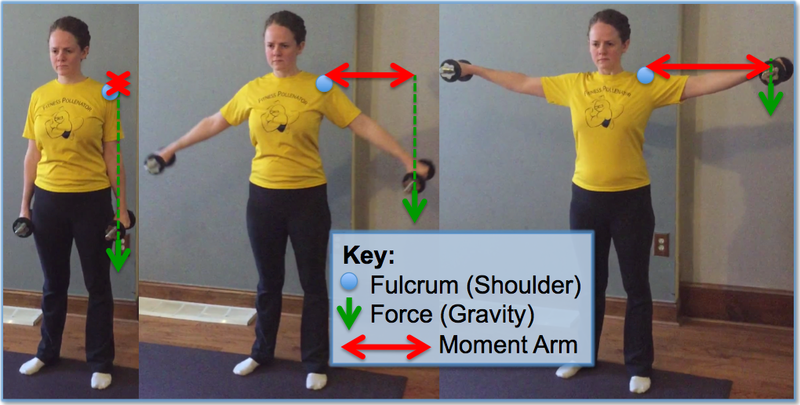 As evidenced above, moment arms are everywhere in resistance training, and a keener ability to identify and manipulate them undoubtedly makes for better training. During your next workout, see if you can identify the moment arm in each of the exercises you do, and perhaps even apply some of the techniques described above. I'm certain it will enhance your gym experience. Many thanks to Dagmar for her spectacular video demonstrations, Bret Contreras for the back extension example and, last but not least, my special stick figure friend.